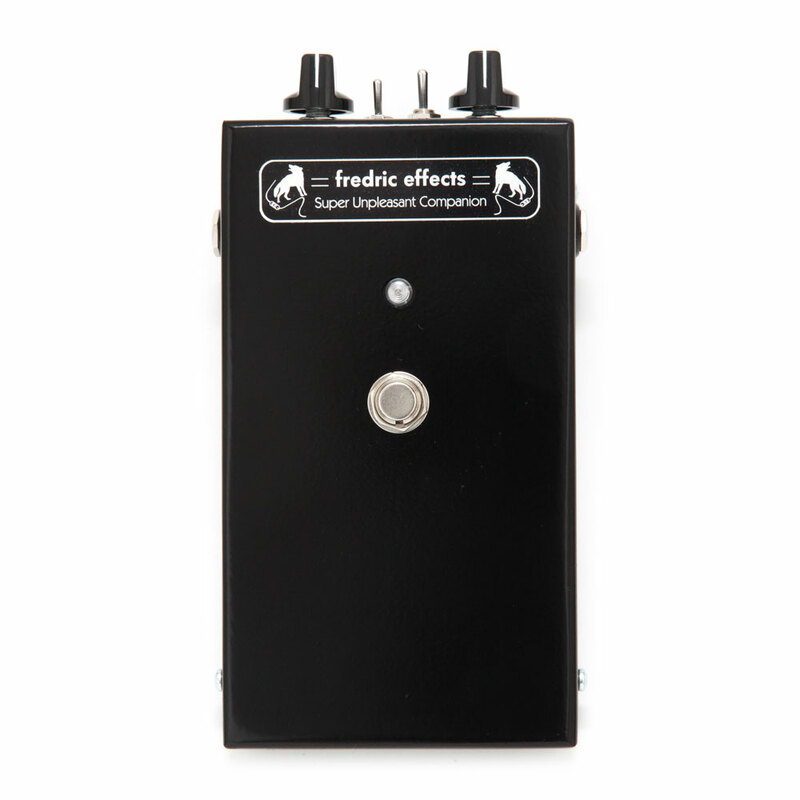 The Fredric Effects Super Unpleasant Companion is two complete pedals in one box, switchable between a Shin-Ei FY-2 Companion Fuzz and a Shin-Ei FY-6 Superfuzz clone, two rare vintage favourites. There is a volume control knob shared across both circuits and a fuzz tone shaping knob which acts differently in each circuit, in the Superfuzz mode it goes from a thin fuzz with pronounced ring mod sounds up to a thick complex fuzz and in the Companion fuzz mode it is a subtle tone control changing the fuzz from raspy to woolly. There is a further tone shaping switch that changes the sound of the fuzz in the Superfuzz mode (not used in Companion fuzz mode). Fredric Effects measured a Shin-Ei FY-2 and got their pedal enclosures professionally fabricated to the same dimensions, they've improved upon the vintage boxes by using 1.2 mm steel, welding the joins, and using threaded inserts for the side screws, so it's strong and study but still not heavy. The enclosures are powder coated for a hard-wearing finish rounded off with a classy 'Super Unpleasant Companion' name plate.